Now that we’ve escaped the zombie throngs, we’re gonna need a new place to call home. Some say that home is any place you lay down your head at the end of the day and that seems like a fairly accurate description of the lives we’re going to leading for a while. With that in mind, we’d better get ourselves a nice bed for our home out under the stars, on the open road, or wherever our journey of survival may lead us for 365 days a year, potentially for the rest of our lives. This is where it really pays off to have invested in a nice lightweight, warm and packable sleeping bag. Which bags are the best, you ask? Well I’ll be glad to tell you. These bags were designed with optimum comfort, scientific efficiency and utilitarianism in mind (I should know, I helped design them. True story.) The HCSB is designed to work as either a stand-alone bag, or in combination with a hammock system of some kind (Grand trunk makes a good one and Eagles Nest does too). 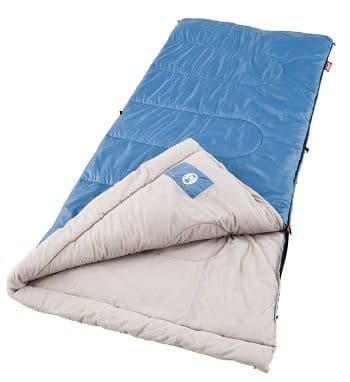 If you use it on the ground, it’s pretty much like other sleeping bags and utilizes a Ripstop Rhombus poly shell, micro polyester lining and synthetic Eulin fiber insulation. It has a double-sided zipper (that means you can open it easily from inside the bag) on either side that runs full length, making for easy cooling down or quick exits. Where this bag really shines however, is when you use it with a hammock system. You see, the way a sleeping bag keeps you warm is not by the insulation itself, but by air pockets that the insulation creates. The problem you run into with traditional bags is that by sleeping in them, you compress the bottom side of the bag and eliminate a lot of insulating capabilities. This leads to cold experiences on nights when the temperature is well above the rating of the bag. Until this bag was developed the only solution to this problem was to add more insulation (and therefore weight) to the underside of bags. 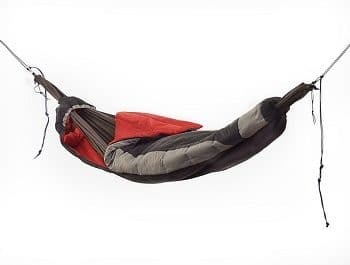 The HCSB however has 2 pass-thru points, one at each end, where a hammock can be run through and hung which then allows the user to be enveloped in a cocoon of warmth with no insulation compression on the back side. This maximizes insulation efficiency, decreases weight and improves sleeping comfort. The HCSB is available in 32 degree or 0 degree options. The Grand Trunk Hammock Compatible Sleeping Bag is the best and probably last bag you’ll ever need. You can thank me later. If you want the lightest and most packable bag in town, that’ll still keep you warm in rough conditions, the Ultralamina 15 is a great one. When I say this bag is packable, I’m talking about a bag rated to 15 degrees that will compress into a sil-nylon compression sack 7 inches long and 3 inches across. This thing will take up so little room in your backpack you may even forget that it is there. The Mountain Hardwear Lamina welded seam process prevents insulation from bunching and keeps you equally warm all over. The Ultralamina 15 also has extra insulation in the foot of the bag for those of you who get cold toes at night. All in all, this bag is economical, packable and warm.